The 5-year survival rate of stage 1 breast cancer is 95%, very close to 100%. Although the 5-year survival rate of breast cancer is high, you still need to choose the right treatment based on your personal situation to avoid worsening. Breast cancer treatment plan varies from person to person, it depends on each patient's tumor size, type, patient's own circumstances, personal wishes, etc., If you want to know which treatment technologies are right for your personal situation, please call 010-2066616. We’re here for you to discuss treatment options. 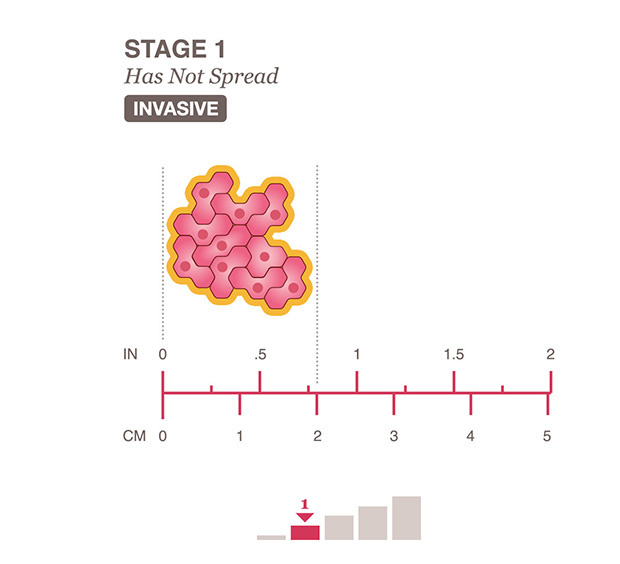 Stage 1 breast cancer is an early stage of cancer, indicating that the cancer cells have spread in and around the primary site. The tumor was less than or equal to 2 cm and the cancer cells did not spread around. A small proportion of cancer cells were found at the lymph nodes, less than 2 mm. There is not necessarily a solid tumor or tumor less than or equal to 2cm. Surgery is one of the common treatments for breast cancer. Some stage 1 breast cancer patients may choose to undergo surgery, but some are not suitable for surgery. At St. Stamford Modern Cancer Hosiptal Guangzhou, doctors remove lymph nodes that are spread by cancer cells but do not remove the muscles of the breasts in order to rebuild the breasts and maintain the original shape of the breasts. If you do not want to undergo surgery, you can choose other treatment techniques as follows. Green chemotherapy is a new type of chemotherapy, which is different from traditional intravenous chemotherapy. Intravenous chemotherapy may cause more side effects. In contrast, green chemotherapy is based on the body's biological clock. Injecting anti-cancer drugs during the active period of cancer cells can effectively increase the effect of the drug and cause fewer side effects, because during this time, cancer cells are relatively active. Normal cells are relatively inactive. Radiotherapy usually has multiple ways, usually combined with other treatment options. Radiotherapy may produce acute or chronic side effects. Acute side effects may occur during treatment, and chronic side effects may occur months or even years after treatment, including fatigue, nausea, and vomiting. The factors that produce side effects include the location of the treatment, the amount of medication used, the patient's physical condition, and the effects of other treatments. Hormonal therapy is to prevent female hormones from affecting the growth of breast cancer cells. Some types of breast cancer are rapidly growing due to the influence of estrogens, so hormone therapy is suitable for this type of breast cancer patients. You need to understand the type of breast cancer you have so that the doctor can give you appropriate treatment advice. Gene targeted therapy is to "attack" cancer cells by identified drugs or other substances without causing damage to normal cells. At St. Stamford Modern Cancer Hosiptal Guangzhou, we provide gene targeted therapy, which can effectively treat cancer by addressing the root causes of the disease and does not bring any trauma or huge side effects to the patient. At St. Stamford Modern Cancer Hosiptal Guangzhou, doctors combine Chinese medicine treatment with other treatments. Traditional Chinese Medicine can help you reduce or prevent the possible side effects of other treatments. At the same time, Traditional Chinese Medicine can help you improve your immunity and prevent cancer from recurring. Cryotherapy, also known as "argon knife," releases argon to lower the temperature, "freezing" the tumor and its surrounding tissues; then, replacing with helium to warm the environment, allowing the tumor to thaw, thus destroying the tumor tissue. Interventional therapy is a mini-invasive therapy performed under the guidance of medical imaging equipments. With a 1-2 millimeter incision and a special tube, catheter or other sophisticated apparatus, anti-cancer drugs are introduced to inhibit the growth and spread of cancer cells, so as to cut off the tumor’s blood supply and reach the effect of local chemotherapy without any toxic side effects of chemotherapy. Compared with the traditional intravenous chemotherapy, interventional treatment directly affects the tumor, greatly reducing the side effects on the body, and the drug concentration of the lesion site is higher than traditional chemotherapy, greatly improving the therapeutic effect. Microwave ablation refers to inserting a 2mm probe into the tumor area and directing microwave energy into the tumor to directly destroy the thawed cancer cells. Microwave ablation has a clear goal and a strong effect. It does not produce toxic side effects on normal tissues. Photon knife, shorted for photon isotron system, is a medical approach to kill tumor cells by photon radioactive ray. It is named as photon knife due to its equal effects as scalpel. The advantage of this treatment is that it can accurately locate the tumor and avoid harming normal tissues. Precise positioning can be used for radiotherapy at a specific location, thereby greatly improving the therapeutic effect and eliminating tumors. The Nanoknife uses current to break the cancer cell membrane and destroy the cancer cells. This is not a traditional surgical operation, but it has the effect of surgery. Its advantages include less trauma, fewer side effects, and faster recovery.